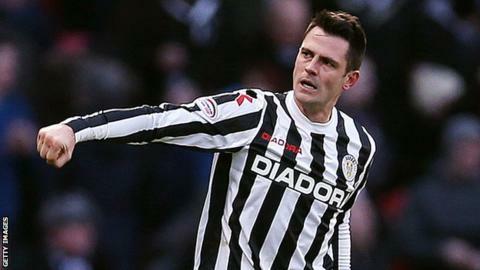 St Mirren captain Steven Thompson says he is "mortified" after injuring team-mate John McGinn with a spiked pole in a training ground prank. Thompson threw the pole at McGinn which pierced his thigh and resulted in the 20-year-old missing Saturday's win over Kilmarnock in the Scottish Premiership. The Scotland Under-21 midfielder is expected to be out for a further three weeks with the injury. "I'm mortified by the whole thing," said Thompson. "It was a daft prank." Speaking to the Scottish Sun, the 36-year-old added: "I threw it for a laugh, stupid me trying to be funny, and unfortunately it's anything but. It's a total disaster." St Mirren refused to comment when contacted by the BBC and said they would be dealing with the matter internally. The incident took place last Thursday at the Ralston Training Complex after McGinn robbed Thompson of possession during a dribbling routine. Thompson said the pole went a centimetre into McGinn's leg and has torn the muscle, but not caused any long-term damage. The striker added: "I've been shocked by it, to be honest, really down about it. I like a laugh and a joke in training, but for something like this to happen is just unbelievable."